This article is mainly for newcomers here in Thailand, but those who had been here for years may use the comment section below to share their insights as well. Life abroad is not easy. There are so many things to consider, most especially the loved ones who are left at home… miles and miles away from us. As overseas workers, living a life like locals is not easy but you’ve got to adopt what is needed in order to survive and save for the future. Thailand is one of the best places to work and live. In fact, the influx of Filipinos in Thailand is rapidly increasing. It is one of the most favorite destinations of the OFWs especially for those who want to teach English as Foreign Language. But Thai economy is not always stable; therefore, the prices of basic commodities like rice, vegetables, meat, etc. are also affected. Inflation rate rises. Meaning, the value of 100 Baht few years ago is not the same as it is today. In this article, I am going to share with you insights on how to live like locals and choose either buying from “Talat” or from the air-conditioned supermarkets. “Talat” is a Thai word which means “market”. Literally a wet or flee market. In Bisayan language “tabu-tabu”. A market without permanent building. 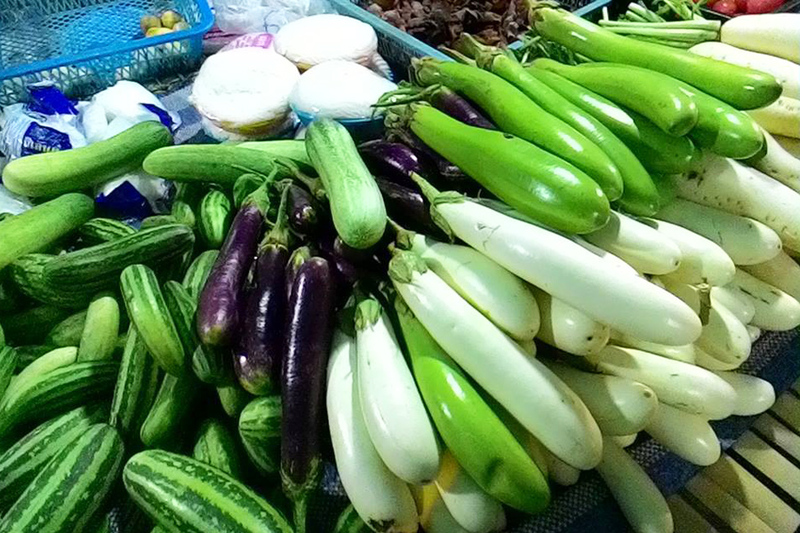 In the Philippines, we call our markets as “Public Market” where you could find varieties of products like fruits and vegetables, fish and meat, flowers, etc. We don’t usually have “Talat” in the Philippines like what we can see here in Thailand. Talat here in Thailand is visible few meters away from each other. Whenever there is a small community (with apartments and condo) you will see a talat nearby. In the Philippines you can find one public market in every city. People usually go to the cities to shop in the supermarkets. In Thailand, people can either go to talat or supermarkets for their basic needs. When I first arrived here in Thailand, I did not know how to shop from Talat. Beside from the fear of miscommunication, I was also afraid to meet some police. Hahaha! Because I do not have the work permit then, and if the police catches me without proper visa, they might detain me to the police station for a night or two. Well, I enjoyed shopping in Big-C or Tesco Lotus not because it’s convenient but because I did not know how to ask for the “price” nor ask for “discount” in Talat. The comparison below is based mainly from my observation. When I say supermarket I mean to say the Big-C, Tesco, Makro, and the likes. You can find varieties of products in the supermarkets. From meat, fruits, vegetables, dried goods, toiletry, clothes, sports equipment, stationery, drinks, gadgets, electronics, name them all and you can find them in the supermarkets. Supermarket is a one-stop-shop for you. In Talat, the products are very limited to daily consumption only like egg, rice, fruits, vegetables; mostly foods. There are also dried goods like kitchen wares and clothes but not as much as in the supermarkets. I should say, products in the supermarkets are not as fresh as those in the Talat. Why? because they are inside the building and normally products like fruits and vegetables, and meat and fish are refrigerated to extend life. Fruits and veggies are normally stored for a week or more. If you are a vegetarian, then Talat is the best place for you to buy fruits and vegetables as they are freshly sold there. Newly harvested produce are normally sold in the market and they are usually sold out within the day, so you can assure of its freshness the next time you visit your favorite Talat. It is just normal to be tidy and organized in the Supermarkets because they are inside the building. Proper sanitation is very necessary, if not, the smell of rotten fruits and vegetables or meat and fish will spoil the whole building and everything inside is affected. Well, to be fair, Talat here in Thailand is not the same as most markets in the Philippines. Talat here are comparably tidy and clean with the indoor supermarkets. They keep the place dirt free and dry. No stinky smell as they are cleaned every after use. Price of commodities in the supermarket like noodles, eggs, oil, soy sauce, detergent, soap, toothpaste, and other basic needs are quite low compared to that in Talat. You may ask, why? It is because products like these are delivered in wholesale price directly from the suppliers’ warehouse and the supermarket gets big discount on that. On the other hand, products like fruits and vegetables are normally higher in supermarkets than those in Talat. It is because the farmers bring their products directly to Talat, without the usual third-man in between. The price difference can range from 1 Baht to 10 Baht. For example, apples in the Supermarket are 15 Baht per piece while in Talat it’s only 10 or 12 Baht each. Well, talking about price, it depends on the kind of product you are buying but since you can normally see fruits and vegetables in the Talat, then you can conclude that it is cheaper to buy fresh products like fruits and vegetables in Talat. For example one big bunch of Chinese cabbage is only 10 Baht in Talat while in the supermarket only a few stalks for the same price is 10 Baht. There are a lot of advantages and disadvantages between Talat and Supermarkets. It is up to you to decide where to buy. Survey your needs and decide properly where to shop next time but my recommendation is that, if you are buying fresh products, go to Talat. For dried goods and RTWs, go to the supermarkets although prices of clothes from the Talat are negotiable so might as well shop there for clothes. You can also find RTWs in talat. Fish or meat might be cheaper in Talat as well so try it. It is fun to shop outdoor during the night and it is also fun negotiating the prices. In the Supermarket, what you see is what you get! It is also helpful to learn Thai words for negotiation and asking for price, etc. I learn only few of them but efficient. Thank you so much, I hope you enjoyed reading. For more Diskarteng Pinoy, you may visit my site at MayDiskartengPinoy.com.